Texas Rangers starting pitcher Cole Hamels throws during the third inning of a baseball game against the San Francisco Giants in Arlington, Texas, Saturday, Aug. 1, 2015. 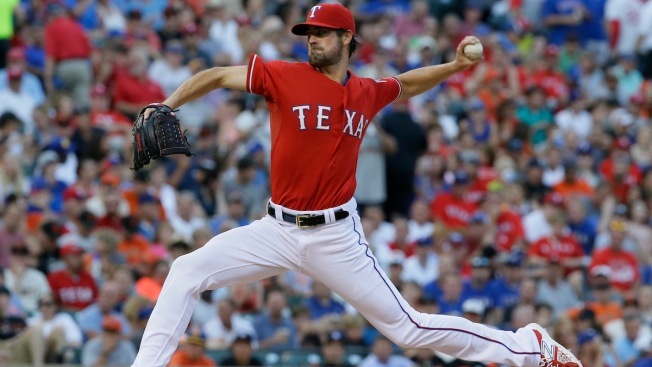 The Texas Rangers will skip the next start for left-hander Cole Hamels because of his sore left groin. The injury was not believed to be serious. Hamels was scheduled to take the mound Thursday in Minnesota. General manager Jon Daniels said Tuesday, before the Rangers played the Twins, that one of two right-handers with Triple-A Round Rock, Chi Chi Gonzalez or Anthony Ranaudo, will be summoned to fill Hamels' spot. Gonzalez was the Rangers' first-round draft pick in 2013. Ranaudo made two starts earlier this season. Hamels told reporters he felt the muscle grab in his previous start. The Rangers made a bullpen shuffle by recalling right-hander Keone Kela from Double-A Frisco and optioning right-hander Luke Jackson to Triple-A Round Rock.